This dairy free ice cream with mocha and chocolate chunks is has no refined sugar. I recommend using an 85% dark chocolate and chopping it instead of using chocolate chips in this dairy free ice cream. Dark chocolate has many health benefits and very little sugar. If you don’t have an ice cream maker, I recommend this one. When I was in Nutrition School, we had to use a Glucometer (this is the one I use) to measure our blood sugar so that we could see how food affected us. Normally, my fasting blood sugar is around 80-85 and after eating a low carb, high protein, low glycemic meal, my blood sugar will go to 120 at the highest. One day I decided to make grain-free pancakes. All of the ingredients were low carb and low glycemic. I decided to throw in some chocolate chips. I thought that because all the other ingredients were low in sugar and it was such a small amount, it would be fine. I measured my blood sugar an hour later and it jumped to 170! The chocolate chips were the only food that had sugar and carbs in it, so just a little can really affect you. So, I am using dark chocolate chunks in all of my recipes now, not chocolate chips. I actually threw out all of the chocolate chips in my house after this happened. 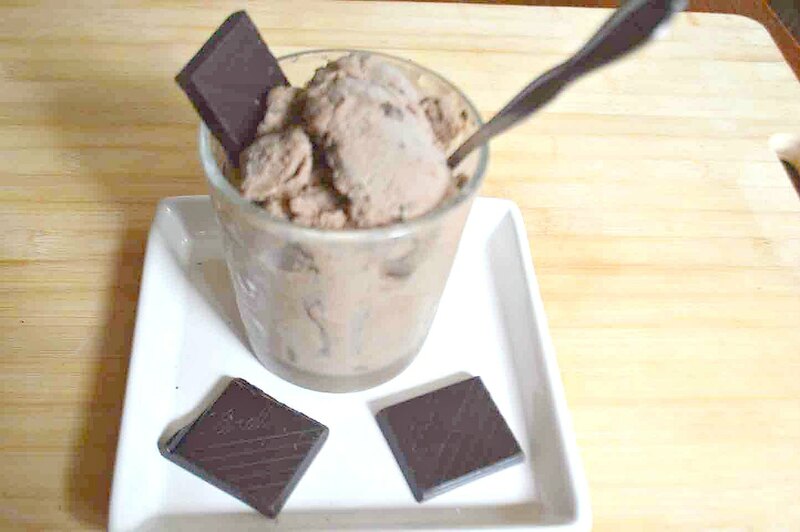 This dairy free ice cream with mocha and chocolate chunks is has no refined sugar. Break or chop the chocolate into small pieces. *You could use chocolate chips but I don't recommend them as even the healthy ones have too much sugar. The 85% dark chocolate has very little sugar. Place the coconut milk, cocoa, coffee, vodka and sweetener into the blender. **The vodka is optional. It gives the leftover ice cream a better consistency when frozen. If you don't want to use the vodka, just make the amount that you are going to eat so there is none leftover. Pour the mixture into the ice cream maker. Wait 10-15 minutes until the ice cream forms the consistency of a soft serve ice cream. This looks so good! I love the coffee ingredient! I bet that makes the chocolate just pop! Yum, I love coffee drinks… funny you put optional vodka! 🙂 It would be a good “adult” beverage! Hi Rachel, The vodka is really only so it freezes better; however, for people who can tolerate alcohol (not me unfortunately), adding more vodka would make this a really great frozen drink. Using small amounts of vodka has been great. Before I learned this trick, I had to make ice cream everyday because it came out horrible when I froze it. Now I can make bigger batches, freeze the leftovers and just make it every few days. Perfect! Love dairy free choices. Yum! Love this combination of flavors!